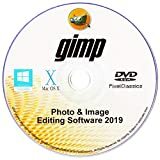 The GIMP, which stands for "GNU Image Manipulation Program", is a powerful desktop-based bitmap editor and photo editing software (with some vector capabilities) released under an open source license. Versions of the programs are available for Microsoft Windows , the Apple Macintosh, and Linux. Commercial distributions of the program, typically include a clean and straightforward installation procedure, documentation or tutorials, and in many cases, additional items such as add-on tools or clipart libraries, video tutorials, etc. If you are looking for an easy-to-use package, one option that you should consider is PhotoEditorX† which includes step-by-step instructions and video training (see Review of PhotoEditorX). Once installed and working, the GIMP is relatively easy-to-use, but it is a powerful program that takes time to learn. If you chose to use PhotoEditorX† , I expect you will probably be happy with the instructions and video training including with the package - but if not, there are still lots of options to help get you started: There have been several books written about the GIMP, and there are also downloadable tutorials available such as Master The GIMP† . 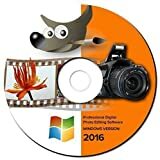 PhotoEditorX is a very complete software that can be used to edit photos in a very professional way. It's very easy to learn how to handle it and with this software you'll be able to edit your photos to become as good as the photos you see in magazines. 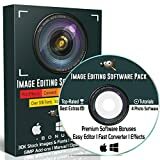 This is a great system that will help you create perfect pictures from scratch and you don't need any photo editing skills to use this software. This software has a bunch of appealing features and it will take you plenty of time to explore them all. The program makes it possible for you to try image manipulation, simple resizing of your images and many other things and all the features are very useful whether you want to use this for private purpose or in your business. The greatest thing of all regarding PhotoEditorX is that it's perfectly suitable for professionals as well as beginners. Everyone can use this and get satisfied when they see the results. It's not exactly a low budget alternative since it's better than many expensive alternatives, but it is a cheap alternative with high quality. Thousands of people use this software on a daily basis, some of them work with it to edit pictures for magazines and newspapers. The results that you get are always amazing and there are simple guidelines to follow in case you don't understand how to edit your files. Would you like to have nearly all of the capabilities of Name Brand photo editing software, without the high cost? You've come to the right place! This professional photo editing software for Windows is undoubtedly the BEST Photoshop alternative currently available, and will open up your PSD files. NEW 2016 Version Released! Yes, we all love that industry-standard CS or CC software made by corporate giants. But did you know that company recently moved to a "subscription-based" software platform? This means that if you want to use their Cloud software, you'll have to cough up $20-$50 per month FOR THE REST OF YOUR LIFE as long as you keep using it. If you stop paying, none of the files you saved or created can be opened until you start paying again! Who has the money for that kind of nonsense? Don't get suckered into turning your software needs into just another expensive, monthly bill! It's much easier to get this CD. It's a fraction of the cost, and has most or nearly all the capabilities of "that other program". You too can be a master photo editor, without breaking the bank! What are the system requirements? Any version of Windows! GIMP has very little system requirements. 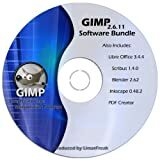 If your computer is able to display a desktop environment you can run GIMP. Check out the FEATURES OF THE GIMP SOFTWARE: Basic Photo Retouching Remove Annoying Red Eye Create Awesome Coloring Book Pages Remove the Background from Your Photos Create Dramatic Blur and other Special Effects Create Works of Art with Digital Painting Advanced Image Editing & Manipulation Advanced Color Correction and Color Editing Create Stunning Graphic Design An Interface that is Easy to Learn and Use BONUS ITEMS INCLUDED: Photoshop® Keyboard Shortcuts Guide GIMP Keyboard Shortcuts Guide - How to make the keyboard commands the same as that other program! With features nearly identical to that other ridiculously-priced program, almost free in comparison, this decision is a no-brainer. Customizable Interface - Each task requires a different environment and GIMP allows you to customize the view and behavior the way you like it. Digital Retouching - GIMP is ideal for advanced photo retouching techniques. Get rid of unneeded details using the clone tool, or touch up minor details easily with the new healing tool. File Formats - The file format support ranges from the common likes of JPEG (JFIF), GIF, PNG, TIFF to special use formats such as the multi-resolution and multi-color-depth Windows icon files. Originally released for use in the Linux desktop environment, GIMP has grown by leaps and bounds, becoming a very powerful, popular, and versatile program used by millions around the world. 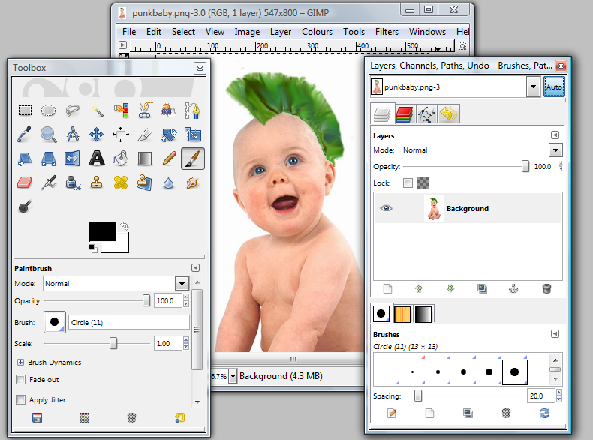 GIMP is a graphics editor used to process digital graphics and photographs, and is very similar to Adobe Photoshop. Typical uses include creating graphics and logos, resizing and cropping photos, altering colors, combining multiple images, removing unwanted image features, and converting between different image formats. GIMP can also be used to create basic animated images in GIF format. GIMP's manipulation tools can be accessed via the toolbox, menu paths, and dialog boxes (which are also known as palettes). They include filters and brushes, as well as transformation, selection, layer and masking tools. GIMP comes with 48 standard brushes, plus facilities to create new ones. Brushes (and brush tools) can be used in hard-edged, soft-edged, or eraser modes, be applied at different opacities, or used with different modes for composition. Don't spend hundreds of dollars on Photoshop, when GIMP will do it all for a fraction of the cost. The Ultimate In Image Processing. including 20,000 individual clip art items - over 10,000 photo frames. Compatible with any photo processing program such as Adobe PhotoShop Elements / Lightroom / CS 5 / CS 6 / PaintShop. 900-page PDF manual (in English). Supports Windows (10 / 8.1 / 8 / 7 / Vista and XP) and Mac. Support is provided and source code is provided up on request from your order page. 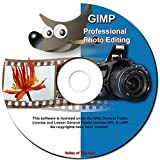 GIMP is a graphics editor used to process digital graphics and photographs. GIMP is similar to Adobe Photoshop. Typical uses include creating graphics and logos, resizing and cropping photos, altering colors, combining multiple images, removing unwanted image features, and converting between different image formats. GIMP can also be used to create basic animated images in GIF format. GIMP's manipulation tools can be accessed via the toolbox, menu paths, and dialog boxes (which are also known as palettes). They include filters and brushes, as well as transformation, selection, layer and masking tools. GIMP comes with 48 standard brushes, plus facilities to create new ones. Brushes (and brush tools) can be used in hard-edged, soft-edged, or eraser modes, be applied at different opacities, or used with different modes for composition.